The expat divide has many definitions. In this article, expat divide takes on a new meaning. Why do many so-called expats face hard decisions as a result of a more inward-looking world? Some even feel they no longer have a ‘home’ to go to. A new expat divide is growing as life as we once knew it is changing. That bridge to ‘home’ is no longer a given. Find out if you recognize yourself, and how you can tackle some of the challenges a global nomad. This website is about wellness in all its dimensions. Wellness is a state of balance between all the dimensions from physical to intellectual. A fundamental basis is the ability of choice, and access to these choices. Where we live and work is rarely brought into the discussion about wellness or wellbeing. However, if don’t know where ‘home’ is, or will be your ability to feel, be and do good is at stake. Rootlessness is but one dilemma for international globe hoppers. The new expat divide provokes multi-facetted challenges and emotions. By the way – how do you define ‘expat’? And – what do we mean by ‘home’? Expat Divide: What is an Expat? The statement that it is standard of living and quality of life that makes many never return ‘home’ may be right for a few expats. For many more, this is far from the truth. Choices are more complicated and access even more so in an increasingly complex world. Expat Divide: Where is ‘Home’? Is ‘home’ where you are born, where you live or where you spend most of your time? According to the dictionary, a home is a place where one lives permanently, especially as a member of a family or household. It can also relate to where one lives if the ‘home’ is used as an adjective. These definitions make little sense if you are an expat with several moves under your belt. Location becomes fussy as ‘home’ is a concept rather than a place. As a third generation expat, I have seen the shifts in world politics and how they impacted each generation: My grandparents – who had to drive across Europe during world war two as my grandfather’s career took an unexpected turn. My parents could not make choices based on logic, wishes, and needs. Developments outside of their control decided where our next place of temporary home would be. My husband and I come from two different countries, reside in a third and work across the globe. Like previous generations, we live with similar challenges but are faced with new realities. While I have no distinct ‘home’ country per se – I have ties to ‘everywhere and nowhere’. The expression home is different for me than for most people. The expression TCK – Third Culture Kid works in my case. My husband is a first generation expat. He has grown up in one place, and all that is this country firmly infuses his relatives. His life abroad was an exotic experience that became a life outside. In so many ways it is far less exciting than what those at ‘home’ think. The more the world politics evolve, the more complicated our way of life is becoming. Our choice to not live in either of our passport issuing countries was always one we stood by. Now, however, this choice is becoming a dilemma as our own set of beliefs faces a question every time we think – what or where next? We have realized that while we choose to live our life the way we do, the access to our choices is shrinking. A choice of a place to live is one thing. Access to where we may choose to live is quite another. The expat divide used to refer to the difference in pay and benefits between local and international staff. There is, however, a new meaning to the expression, which has little to do with contractual status. Wikipedia defines an expatriate (often shortened to expat) as “a person temporarily or permanently residing in a country other than their native country“. For us living outside, it is nor a temporary nor necessarily a permanent status. It is how we live. Period. There is no timeline – but the idea that we have to make difficult decisions has become an example of the new expat divide. There is nothing new in the sense of division between those that live and work across borders vis-a-vis the relationships with what is considered home. The new reality, however, is that the so-called ‘home’ may not be as accessible if you come from a dual nationality relationship (or work across the globe). When you move to a new place you will come with your baggage of beliefs, and standards. The new country will offer experiences and challenges. It is the classical cultural divide. To bridge the gap isn’t always comfortable but you grow from the more you see, do and learn. The more painful divide is the sense that those at ‘home’ no longer speak the same language or understand you. The reality hits when you feel like a stranger in your so-called homeland. Yet you remain a forever foreigner in every country you live in. The cultural divide is not new for expats. When you experience it both in your adoptive, temporary or passport country the expat divide sinks in. Your life is simple in your eyes. When politics come into the picture tensions rise. A decision made in your ‘home’ can provoke the most difficult of situations bureaucratically, and very much so emotionally. Everything is clear based on your set of global nomad beliefs. You know where you come from and what you stand for. Your international globe-hopping gives meaning to the expression ‘the world is a global village‘. The new expat divide sets in when politics impact you and your family directly At ‘home,’ the increasing protectionism influences voters. Even those closest to you seem to follow a new way of thinking that you cannot get. The divides can grow into an emotional and practical abyss. There is no ‘normal’ when it comes to love. You meet and decide to spend your lives together. When politics come to the forefront your beliefs as a couple can stand in stark contrast with those at ‘home’. Especially, when discussions center around terms of ‘us and them’. If you are a couple who have different nationalities and live around the world the equation does not come together. While you try to understand how you can overcome the growing sense of being forever foreign, you also feel that ‘home’ can never be ‘home’ again. The new expat divide has a very different meaning when it comes to separation across the miles. As an expat, you rarely consider plans that don’t include the ‘where’ question. For those at ‘home’ life decisions are a question of emotions, money, timing, and logistics. As an expat, you consider this too. But, the ‘where’ is no longer as easy as borders become a real issue – especially when you come from different countries. Whereas before you could choose to live in one place, today the right to live in a said place is no longer a given. Many non-expats think that expat life is a glossy, jet-setting experience that comes with perks and tax breaks. Some even believe that expats by definition must be involved in something illegal, as prejudice dictates that you must be running from something to settle in a foreign land. Immigration is the act of trying to obtain citizenship in another country, by choice or because you cannot return to your homeland. Expats retain their passport, while they have a temporary residence in another country, but here comes the quirk. Choices are rarely given to immigrants – whereas expats seem to have plenty. Today both choice and access to this choice are changing. As much as we have expatriated from our countries, we like the idea that we have the choice to go back – or wherever we want to go. As the luxury of choice is becoming curtailed, you start to understand more deeply the emotions that come with migration. The sense that you may not be able to return, or have bureaucratic hurdles that are insurmountable. That these have been created to no small extent by voters, make it emotional. It creates feelings of loss, anger, incomprehension, and grief. The expat divide is not how you bask in the sunshine, while those at ‘home’ endure the constant cold. It is instead a growing sense that you are the ones who are not welcome anymore. SO what do you do? Embrace what you have and find solutions that can cater for a foreseeable future by sitting down and actively mapping out options. Separate the emotions from the purely practical. As an experienced global nomad planning becomes an art, and you know how to play the game of international life plans. Therefore, you can revel in your ability to divide what is real from what is not – and plan A, B, and C – to weigh options. Stay informed to keep abreast of changes that are coming. With so many social media hiccups of late, it is worth considering fact versus fiction. You can find a strategy that can work for you and your family by checking official websites (embassy, government etc) for real rather than fake news. Be part of networks to exchange information, tips and make friends from around the globe. Internations or any of the ones listed here are a great start. 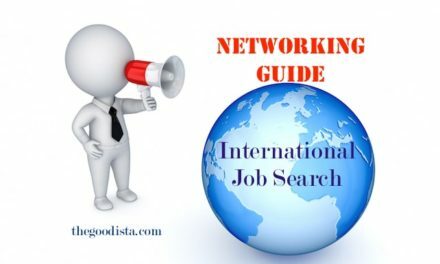 Actively search for international jobs that can bring you closer to your long-term goal. Check what impactpool can help you with, and/or do sign up for professional networks like LinkedIn. International life can be a challenge. It is also a way of life for many that no longer find that ‘home’ is an easy word. For us home is a place which makes us feel comfortable, safe and zen. This place is maybe not a location, but things that you have collected over time – and the people that become vital to your overall sense of self. Whatever the future holds, home is where the heart is, and hopefully, you will be able to choose to stay where you want to be. Do you relate to the difficulty of making the choices for your life and career that makes sense? Let us know in the comments form – and keep on reading The GOODista to feel, be and do good – every day and working (far) away. Thanks for reading The GOODista – and welcome back anytime wherever you are!